Biographies of great writers, thrown together too soon after their deaths, tend towards the condition of a first draft of a life. The availability of living witnesses willing and eager to be interviewed, friends with scrapbooks and snapshots, even important locations as yet unchanged by time, seem to be too tempting to be ignored. Recent examples of this rush to be the first include Eric Jacobs’ biography of Kingsley Amis and Norman Sherry’s of Graham Greene. Both of these were inferior jobs. 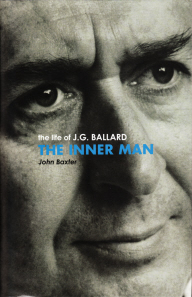 Now here is John Baxter’s biography of J. G. Ballard, in print only two years after Ballard’s death. Baxter has previously written biographies of people like George Lucas and Robert De Niro, which I have not seen, but the Ballard biography is probably his first of a writer, and the first of a major author of international repute. The book has presumably not been authorized by anyone, certainly not by Ballard’s daughter, Beatrice, who has accused Baxter of hurrying this book out to make a quick buck, saying she had filled six pages with Baxter’s errors of fact. Baxter claims to be Ballard’s literary contemporary, presumably as a justification for his rush to write this book. Technically, he’s correct: I well remember a number of stories by John Baxter in the Nova Publications New Worlds. At the end of 1962 I had discovered that J. G. Ballard was a frequent contributor to New Worlds so I started buying it regularly. What I soon realized was that with the exception of Ballard’s brilliant early work, and a few good stories by Brian Aldiss, the pages of New Worlds in the early 1960s were filled with mediocre work, mostly concerned with Earthmen solving puzzles on alien planets. Baxter’s stories were typical of this kind of thing, written in pedestrian prose and using familiar plots. The antithesis of Ballard’s stories, in fact. I feel a keen sense of anger at this faux modest attempt to present himself as some kind of equal. To be fair, Baxter’s writing style in this book is not as bad as his turgid early stories, and the uniquely interesting quality of Ballard’s work and life makes for a book that’s good enough. However, I’m left with the impression that if there is to be another biography it should be written by a writer of equal stature to Ballard himself, not a showbiz journalist who listens to gossip. Gossip is the main weakness of Baxter’s book, because he falls foul of the temptation to rely too heavily on the memories of living witnesses. From evidence I have seen elsewhere, much of this book appears to have been heavily influenced by long interviews with Michael Moorcock. Baxter does acknowledge this: he refers to the ‘many hours’ in which Moorcock ‘recalled his memories of the man who, for three decades, was his closest friend’. Moorcock regularly describes himself as ‘Jimmy’s best friend’, as he has done in several long, rambling letters published in Pete Weston’s Relapse. Who can dare to question such an affectionate claim? As it happens I knew both men at this time, but did not see them together on any occasion. Whenever I saw Ballard alone he never once acted in the outrageous ways Baxter claims. On the contrary, he always appeared quiet, thoughtful and socially ill at ease. In his senior years, Moorcock has become a self-appointed chronicler of certain periods of the past, and in my view and direct experience (see my review of his blustering The Retreat from Liberty, published in New Statesman in 1983, in which I described how, unfortunately for Moorcock, I had happened to be present at one of the formative anecdotal experiences he claimed) he is an unreliable witness who filters every impression or experience through his own ego. One should weigh in the balance every word of his gossipy memoirs, which is something John Baxter clearly has not done. Throughout the book, Baxter refers to Ballard as ‘Jim’, which I consider a presumption too far. First-name terms should be reserved to family and genuine friends. Baxter quotes freely from Ballard’s own utterances, presumably from articles or interviews, but does not note the source or give credit. Although there are at the back of the book a few pages of acknowledgements, and a long list of sources, none of these is cross-referenced to the quotes. How did the publisher allow Baxter to quote so much copyright material without direct acknowledgement or (apparently) permission? There is no Contents page. And how did the publisher approve the index, which not only contains a maze of passing references, but many subsidiary references without annotation? E.g. the index entry for New Worlds consists of thirty references by page number alone (and on investigation many of these turn out to be passing references). This lack of scholarly attention makes the book a poor reference work, even for an ordinary reader seeking information. It is anyway a poor show. J. G. Ballard, now rightly recognized as one of the major 20th century writers, clearly deserves a substantial biography, but this is not it. Dying is obviously an increasingly risky business. Get a few books published, or a few films made, and the gossips are out there, waiting for you with their unknown personal motives and their attempts to insinuate themselves into what little they can discover of your private life. I should hate to think that two years after my own death, my family would have to put up with a tabloid account written by a stranger, reporting what other people have said about me, and referring to me throughout as ‘Chris’.